Thank you to all our generous donors, sponsors, and volunteers who have made our Gala Dinner of November 1st a great success! The event raised over SGD 97,000 for the Chiang Rai Village Project. 100% of the proceeds will be used to fund underprivileged minority hill-tribe children’s long-term scholarships and village infrastructure projects. 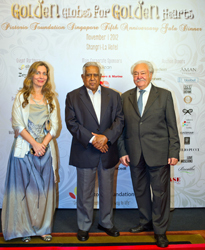 The evening was graced by Guest of Honor, Former President of Singapore SR Nathan. Also present were HE the Italian Ambassador Anacleto Felicani and HE the Thai Ambassador Marut Jipatima. At the dinner, Pasquale Pistorio presented the Foundation’s philosophy and approach and the recent progress of the Foundation’s projects. 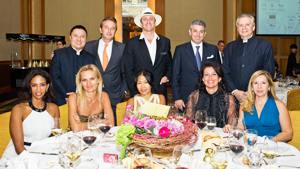 The evening, held at the Shangri-La Tower Ballroom, featured spectacular performances by the Cheng Ballet of Singapore and by six time Ballroom Dance World Champion Mirko Gozzoli from Italy and Lily Cashin of Arca Dance. Tables were elegantly decorated by unique flower compositions created by Ikebana International Chapter 135 members. The Event was Emceed by Vocal Artist Amy Azyza, dressed by glamorous fashion label Zardoze, and who gave a dazzling singing performance while guests savored authentic flavors of homemade Italian Gelato courtesy of Alfero Artisan Gelato. Dancing till late with DJ Victor Repkow topped the evening. Special thanks to all those who have made this event possible: to our main corporate sponsors Cerulean Business Partners, Keppel Offshore and Marine, Mastercard, Shufong Trading, STMicroelectronics, and Union Bancaire Privée; to our event partners Repetto, Cityneon, International Dancers for Humanity, and Shangri-La Hotel; and to our sponsors Zardoze, Audemars Piguet, Ravi Paul Abraham, Aman Resorts, Small Luxury Hotels, Autium, Asiatique Collections, The Orientalist Carpets, Duepunti, Anya Hindmarch, Pirelli, Autoctonous Wines, FBI Wines, Bata, Italian Trade Commission, Sabiana Paoli Art Gallery and Ludmila Kazinkina, Emilio Pucci, La Perla, Goergie Ohlsson, Vive Ninette, Dagmar Jewelry, Love Moschino, Bluebell, Hashi Japanese Restaurant, Gaia Restaurant, Pepenero RestaurantBase Entertainment, Acqua Panna San Pellegrino, Huang Yao Foundation, Perfetti, GreenPrints, Hilco, Studio 36, and Swarovski Elements. Our sincere gratitude also goes to our Singapore Chapter Team and the tireless and dedicated work of our wonderful volunteers.